What is tarot? In essence, it's a system to seek guidance, dig deep into one's own and other people's subconscious to identify and understand topics, feelings and motifs that are not necessarily visible to the outside. And how do yo do it? By interpreting "readymade" presentations of these inner workings, i.e. card pictures. Tarot decks are divided in Major Arcana and Minor Arcana cards. Of these, Minor Arcana is very similar and related to regular playing cards: four suits, 14 cards in each suit, 56 cards in total. The suits have different names in different decks, but they represent four elements: fire, earth, water and air. Fire is often represented by wooden wands (branches, torches etc. ); earth is represented by coins or pentacles (Medieval golden disks); air is symbolised by swords because they cut through the air with sharpness; and water is represented by cups or vessels of some form, containing - surprise, surprise - water. Fire - inner drive, motivation, energy, inspiration, passion (from the negative side including exhaustion). Water - emotions and feelings ranging all over from love and affection to sadness; and from heartbreak to bliss. Air - thoughts and mental capabilities, ranging from clarity to confusion; and from frustration and anxiety to mastery of logic. Earth - stability, long-term planning and goals, pragmatism, material world, earnings and finances, nature. Tarot can also be read in terms of numerology and astrology, as each card has connections to these aspects too; and because tarot cards are based on esoteric philosophy, they also embody Kabbalah etc. which I'm personally not familiar with, and have still managed to practice tarot with success. So understanding tarot history and every possible angle of the cards is not necessary, only optional. Major Arcana contains a storyline, called the Fool's Journey, and it begins with the Fool card numbered 0. The story lasts until the card called the World, numbered 21 (22 cards in total). The journey contains symbols - cards - for each archetypal character and a life lesson a person can encounter in life and learn from it. This journey repeats and/or rewinds over and over again in life, it doesn't mean we only encounter each situation or archetype once. The two Arcanas ("secrets") work together and represent major or far-reaching live events (Major) and smaller everyday actions, thoughts, feelings and situations (Minor). Learning basic card meanings is as fast as you can make it, if you simply go through a deck of 78 tarot cards and memorise a few key words for each. The pictures of cards give plenty of hints for these key meanings. That's your starting point. Biddy Tarot's list of free tarot learning resources. the American Tarot Association's website - in my opinion the most comprehensive accurate list of card meanings. Aeclectic Tarot website because it offers a wealth of resources, explained card meanings and a community to discuss and ask help for interpreting any card. For a more straightforward version than tarot, maybe check out the Oracle system, which I'm not acquainted with but which is explained for example here: the Little Sage. Oracle decks do not have a set structure and are more based on key words and subjective interpreting of pictures, I've understood. Learning tarot key words doesn't cut the mustard, though. It's where everything starts to get you on the right track with what the cards could possibly mean! The real learning comes from practising. My favourite learning deck is Rider Waite Smith, any version will do. There are plenty of reprints around of this 1910 classic deck, they mostly differ in brightness of colours. Pick which appeals to you. RWS is my favourite because its pictures are both simple and packed with symbolism. I've been reading with RWS for four years now and I'm still learning layers and deeper meanings for each card - and probably will continue as long as I use the deck. RWS is handy because it is illustrative and descriptive, not abstract. The cards depict humans doing something, giving clues about what could be the situation, feelings, thoughts, plans and motifs involved. It is also archaic enough to give the cards sort of a "legend" or archetypal feeling: because the people and scenes look like from the Medieval times, it's easier for us to focus on the symbolic meaning of the card instead of getting entangled with the specifics of the aesthetics too closely. There is absolutely no reason why you couldn't learn with any other deck available, there are thousands to choose from. However, given that the majority of today's decks are based on the meanings and symbolism of the RWS, it's sort of the "mother" of where the most decks have branched out. Learning RWS is almost like learning to walk to be able to run, ride a bike, jump, dance, do parkour, you name it! What do I mean by the archetypal? Well, let's examine for example the court cards of the swords suit. 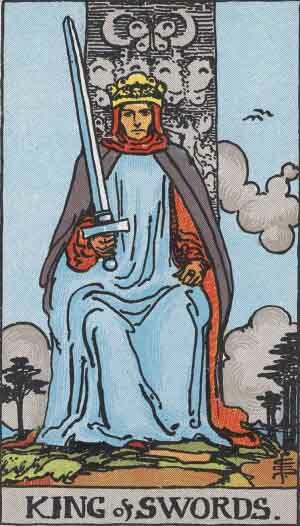 The suit represents thought, logic and clarity and it begins with the Ace of Swords, the birth of a great, clear idea or seeing through the clouds of confusion with absolute clarity. The card numbers range from 1 to 10, then we meet the Page of Swords (the messenger or the student of clarity and new ideas); the Knight of Swords (the fast and furious word fighter), the Queen of Swords (the person who deals with her/his emotions through logic) and the King of Swords (the master of logic and analysis skills). King of Swords by Pamela Colman Smith under instructions of A.E.Waite (c) US Games. The meaning of King - or court cards, in general - is easy to understand in the context of "legend". What is a king? He's the ruler of the land (suit). He has absolute control and power over what he rules. He doesn't sway or hesitate, he doesn't need to. He has a life time of experience in being raised to rule this suit. The Queen, traditionally and in this legend context, is the mother of the country, the leader of emotions, the person who can offer emotional guidance and solace. A knight is a fighter and protector, a soldier of the suit; and the page is the messenger or someone who's learning the higher skills of the suit. Queen of Swords by Pamela Colman Smith under instructions of A.E. Waite (c) US Games. In my opinion, the Queens of RWS mean the feeling when you are well in charge and enjoying your own abilities of that suite, be it passion, logic, emotions or finances. 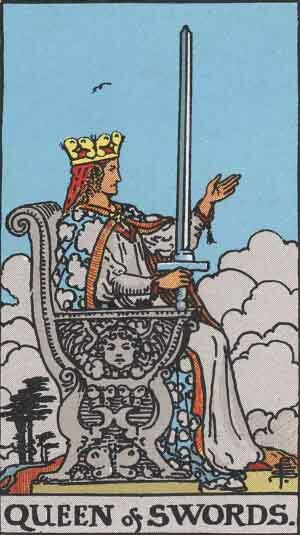 The Kings, in turn, mean that you are in charge of others around you, are able to give guidance and support for others in the realms of that suit: logic, emotions, inspiration or finances/livelihood. In my personal opinion, the number cards or pips of each suit are the easiest to understand through numerology, where even numbers often mean harmony and balance and odd numbers mean instability and risk, but also a possibility. The pip card meanings in a non-exhaustive nutshell: number 1 represents the beginning, number 2 is balance, choice or pairing up, number 3 is growth and expansion (from the pair of two comes three, a couple and a baby for example); number 4 means stability and culmination (4 legs of a chair for example); 5 is instability and seeking for new directions (growing out of the stability of 4); 6 is overcoming the instability of 5, i.e. success of some sort; 7 again is about growth, taking a risk inspired by the success of 6; 8 is when something suddenly aligns perfectly to reveal either a very positive or negative moment; 9 is close to culmination so it's either the very edge of success, the last push or the darkest hour before the dawn; and 10 is the end, closure, culmination - the highest or the lowest point depending on what was culminating. Combine the number meaning with the suit element meaning and voilà, you have the starting point where to work from with your own intuition. Intuitive reading tips coming up soon!